On the days when I start doubting myself whether or not I can keep my promise to my late husband to embark on this journey. Then I think back to the time where he and I met a young lady on our honeymoon in New Mexico. On our honeymoon we were supposed to take Route 66 all the way but who knew in May that it would rain, snow and hail the whole way. So, when we got to Albuquerque, we decided to head south for warmer pasture and ended up taking Hwy 60 back home. While in Albuquerque, we met up with a fellow TW200 rider for dinner who suggested that we check out Pie Town. As we sat down to order a slice of pie, the waitress asked us what the occasion for our trip after noticing our bikes. We told her that we finally tied the knots after 15 years of dating and were on our honeymoon. Then she sat down and began to tell us her story. This here is Kathy our waitress who also happened to be the Pie-o-neer’s proprietress. Why am I making such a fuss over a pie shop in the middle of nowhere? Because the Pie-o-neer is a story of family, faith, struggle, failure and reinvention that has finally paid off and even garnered a bit of national attention. Her story began in 1995, where three generation of Kathy’s family purchased Pie-O-neer and began a full service restaurant that also served pie. However, her mother had to move due to health reason and then her daughter left the nest to pursue a higher education. Running the failing restaurant alone became too much for her that she actually ran away three times. After the third time, she finally stepped back and look at how can she restructured her business to become a successful restaurant. So she rebuilt her kitchen to only cater to a lighter meal and scaled back on the menu. In addition, she put more focus on the pies. 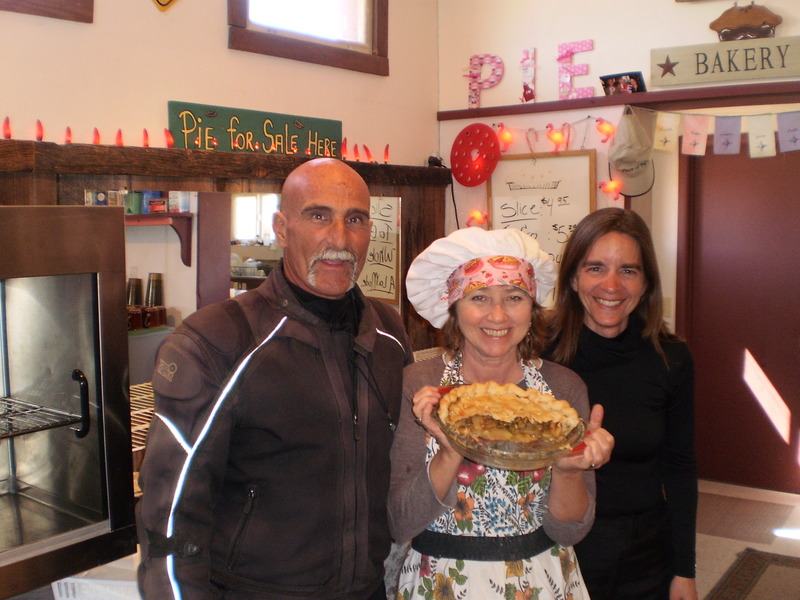 So if you’re ever on HWY 60 in New Mexico, make sure you take the time to stop in Pie Town for a slice of pie and say Hi to Kathy. It will be the best piece of pie you’ll ever tasted. By the way, I would give the apple, green chile and pine nut pie a try. Believe it or not, it is delicious! With her sharing her experience, strength and hope gives me courage and strength to pursue my journey to finding my own two feet again. Pie-O-Neer Café, Milepost 59 on U.S. 60, Pie Town, New Mexico, 575.772.2711, www.pie-o-neer.com; The Pie Festival,www.pietowncouncil.com/pie_festival. Love this story and I want to try the pie.